Well, this is it. We woke up early, ate breakfast but then for one reason or another we were late out of our room and down to reception where our taxi and porter were waiting. The rucksack I have chosen for the trek is about 50 litres and is rectangular; it doesn’t taper at the top. I eventually got all the personal items we would need in there plus two sleeping bag and a down jacket. The other down jacket is strapped to the top. The bag is bursting at the seams and I guiltily handed it over to Hum Raj to take to the taxi. It’s only about 15 kilos but because of the bulk of the sleeping bags and jackets I think it’s quite huge. I took that final photo of us all outside the hotel and then had to go back inside to the wi-fi zone to upload. The hotel staff were quite amused; hopefully pleasantly… The taxi driver started chatting away immediately and then sprang the old “my mother is very sick” routine. I thought it was a bit early in the day to ask for donations to a life saving operation but no, he just wanted to drop her off at a hospital that was on the way. Is that OK? Sure, more the merrier I thought and then tried to go through the checklist in my mind of what we had with us. And then a terrible thought struck me. Where was my bag? My little bag that I was going to carry? My bag with the solar panels, keyboard, chocolate, games for Julian and his homework. (I’ll leave you to think about which of those I was most concerned about.) Yes, of course it had been left back at the hotel with the rest of our spare clothes. Terminally ill mother got in the car and while she looked about 60 there didn’t seem to be anything particularly wrong with her. I think she was just catching a lift to see her cousin Nelly but first she’ll have to see the outside of our hotel. Narayan, our porter, dashed into the hotel got the bag and we were finally off. The three locals chatted to themselves and Julian and I just bounced about at this early hour. The clouds were lifting, the sun was almost out and then Narayan pointed ahead and we saw mountains!! Our first view of the Himalaya. It was Machpuchre, the fishtail mountain but as we drove on it became obscured by foothills. Our taxi driver drove like a maniac, even with his Mum in the car. After about an hour of climbing and hitting every pothole on the road, we dropped of the mother and 20 minutes later we hit the traffic jam that is Naya Pul (1,070m). There were about a dozen taxis and 4 or 5 buses dropping people off to start trekking or picking people up after a trek. It was chaos. We got out of the taxi and I checked the inside REALLY carefully. Then we bought some water and followed Narayan. It was good having him with us at this point because he knew the way through this small village and he also guided me through the two checkpoints where my pass was checked. Details were written down and looking over the clerks shoulder I saw that I was exactly the 100th person through today! No prize unfortunately but it gives you some idea of the scale of the chaos. But within 10 minutes we were walking on a path by the side of a river overtaking some people and being overtaken by others. There were many porters carrying huge loads up for organised trekking tours. The loads were incredible! Rucksacks were strapped together and then a final rope passed around them which the porter balanced on his forehead and then stood up. Amazing. I’m don’t feel so guilty at the load we have given Narayan. The path was fairly flat for the first hour; a much better option than our original route. But then it started climbing mostly on stone steps. And on and on. We stopped for lunch in a hut that is run by one of Narayan’s friend. (He was meeting friends all morning.) We had our first taste of Dahl Bhat; Nepalese simple trekking curry. There was some mild spicy curry soup, some spicy potatoes, rice, nan bread and some volcanic orange spicy stuff. Julian ate it all but I advised him not to even look at the orange spicy stuff so he left that. Over lunch we agreed to try for Ghandruk (1,940m) today. It was quite a challenge but if we stopped halfway then we wouldn’t be able to rest two nights in Ghandruk. So after lunch, powered by Dahl Bhat, we set off. Julian suddenly found some form and off he went. He was ahead for about 30 minutes. Our porter was sometimes ahead and sometimes behind. I’m sure he could do this with his eyes closed. Just before Ghandruk we all came together but Julian and I found those last hundred stone steps a real effort. We were spent. I asked Narayan to find a lodge in the centre of the village (it’s quite spread out vertically) and he did; Mountain View Lodge. It was 4:30 and we had been walking since before 10 (with 30 minutes for lunch). We negotiated the price for 2 nights and then I helped Julian out of his boots and we lay down to sleep. Twenty minutes later our porter knocked on our door. I was almost asleep and not in the mood for anymore hassle today but he told me to come to the roof. I did. I saw mountains. The earlier clouds had parted and they were right there in front of us. Huge. You had to tilt your head up to see the tops. I was speechless. I went back to the room and with his eyes closed I guided Julian to the best spot and told him to open his eyes. He too was speechless. The long walk today was definitely worth it and in the coming days the view will only improve. Tonight we will sleep well and dream of mountains and yetis. 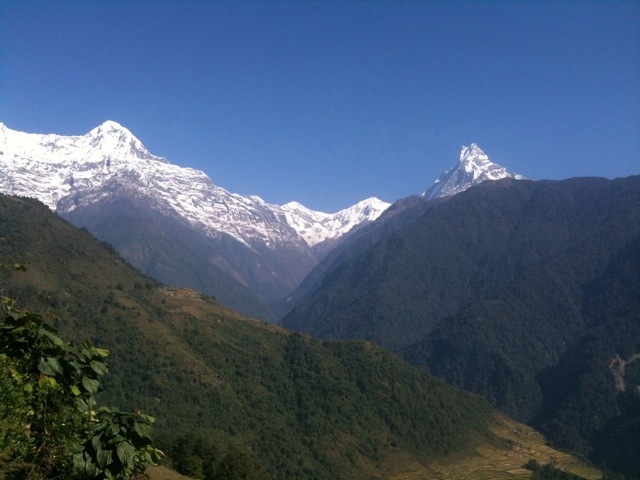 Annapurna III on the left and Machhapuchhre (the fishtail mountain) on the right.